SHOCKING! Yet it’s true! There are more than 5,000 grandparents that we know of who are currently raising their grandchildren in Ventura County alone. At its best, it’s a daunting task for a retired grandparent, frightening and intimidating to a grandparent not yet retired. For the past 13 years, Kids & Families Together has served foster, adoptive and kinship families in Ventura County by providing counseling, education and support services. We believe that every child deserves a safe and supportive family in order to flourish and K&FT has worked for over a decade to bridge the gap between families like LM’s family and the resources they’re in need of. Counseling services: Trauma-focused individual and family therapy, and groups for children, are among many services provided. Education: Educational workshops and support groups help caregivers better understand the children in their care, giving them tools to help their families thrive. Support services: Successful parenting takes dedication and hard work and is more likely to happen when parents are supported by a team of family advocates. Resources: We hold monthly support groups for kinship parents who are facing the challenges of raising the child of a relative or friend. In addition to these and other resources that we provide, each family involved in these programs is assigned a case manager to serve as an individual support and guide. Our goal at Kids & Families Together is to insure that our clients feel supported and have access to all of the resources that they need to provide for the child in their care. Alice’s House is another program run by Kids & Families Together, a cooperative living housing option in Ventura for young adults who were formally in foster care or the child welfare system. Many former foster care youth are ill equipped to live on their own once they age out of the foster care system. The Alice House program is designed to assist youth in developing self-sufficiency and life skills in areas of education, employment, money management, personal development and more. Most importantly, Alice’s House provides residents with a place where they know they are loved and cared for. Kids and Families Together has a vision for Ventura County of supportive and caring families, raising children in a safe and loving environment. It is through your donation that we are able to work towards fulfilling that vision and creating happier, healthier families in our community. Your thoughtful generosity enables us to continue to provide services to the individuals and families who desperately need them in our community. The need for these services continues to grow as do the costs to provide them. You can help. It can cost up to $25 per week to provide a family of 2 with Food Share supplies; up to $125 per session to provide trauma-based counseling services to a needy family; up to $500 to provide desperately needed bedroom furniture for a new Alice House program resident; up to $1,000 to provide an Alice House program resident a semester in college. Adele, your donation is so critical to carrying out our mission and achieving the success we seek in helping so many of our most vulnerable citizens. Please consider making Kids & Families Together one of the top three charities that you support year after year. Generous donors like you are the key to our success and make it possible for Kids & Families Together to continue to provide local individuals and families in need with assistance and critical services. We hope that we can count on your on-going support to help us continue connecting birth, foster, kinship and adoptive families for familypreservation and individual health and wholeness. 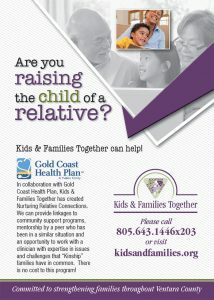 We invite you to call today to make your donation to Kids & Families Together at 805.643.1446 or go online to donate at www.kidsandfamilies.org. Or you may fill out the enclosed form and mail your donation in the enclosed envelope to Kids & Families Together, 4001 Mission Oaks Blvd, Suite P, Camarillo, CA 93012. Thank you for your time and consideration. Thank you for helping us make a difference in so many people’s lives. Thank you for partnering with Kids & Families Together to transform families, one single family at a time. PS: It costs up to $500 to provide an Alice House program resident with badly needed bedroom furniture and linens, something that for most emancipated youth is the first they’ve ever been able to call their own! Kids & Families Together is a California not-for-profit 501(c)(3) organization; Federal tax ID 31-1678238. All contributions are tax-deductible to the full extent provided by law. Thank you for your support. K&FT does not share, sell or trade donor information.